Shree Bharatalaya was founded in 1970 by K Soundararaja Iyengar, Sudharani Raghupathy and Madurai N Krishnan in a covered space available within the family compound (of the Raghupathys). It was a modest beginning, but the ideas that would make Shree Bharatalaya a unique institution of learning were developed and introduced at that time itself. Soundararaja Iyengar, who was then the Secretary of The Music Academy, Madras, was a friend and legal adviser of the family into which Sudharani, (raised in Bangalore and educated there and in the U.S) had married. Sudharani had learnt Carnatic music as well as Bharatanatyam and upon settling down in Chennai, had resumed her music training under vidwan Madurai N Krishnan as her teacher. Without any larger end in mind, Sudharani had begun training a poor girl in Bharatanatyam. This gave Soundararaja Iyengar the idea that she could teach dance to several students. This prompted the father of Madurai Krishnan to ask whether what was contemplated was a ‘Bharatalaya’ (Temple of Bharatanatyam). Shortly thereafter, they set about establishing a school under the name of Shree Bharatalaya (the prefix was suggested by Madurai N Krishnan) with Sudharani as President, Madurai N Krishnan as its Director, and Soundararaja Iyengar as its guide and Counselor. The classes were started in a covered space available within the family compound on Luz Church Road in Mylapore. It was truly a modest beginning. But the concepts and the ideas that would make Shree Bharatalaya not only a pre-eminent but also a unique institution of learning were developed and introduced even then. Shree Bharatalaya has consistently maintained its reputation as a pre-eminent institution that has become one of the foremost centers of learning, and has given the country many of its leading dancers. * The aim is to go beyond providing instruction in dance and music to assisting broader human development, so that Shree Bharatalaya's graduates would be not only competent dancers or musicians but cultured individuals as well. Visits to places of architectural and sculptural interest like temples, museums etc., would be used to serve the larger purpose. * With this aim in mind, students are selected after careful tests to ascertain their potential and aptitude. Only those showing interest in pursuing a general education (in regular schools and colleges) are taken in as students. * There is no guarantee of an arangetram or rangapravesam. Art should be pursued for art's sake. * The emphasis is on quality rather than quantity. The number of students at any time is limited. * The teaching and learning ambience is informal but the training is systematic and disciplined. * In addition to dance and music, students are taught Sanskrit and theory of dance. Furthermore, they are encouraged to learn all aspects of presenting a dance program, like stagecraft and make-up, costume designing and production, and self-adornment prior to performances. They are also given guidance in regard to aesthetics and artistic values. Senior students are taught nattuvangam as well. Thus, the students learn the art of music and dance in their entirety rather than the performance aspects alone, and learn them in the wider context of the arts in general. The syllabus was designed incorporating these goals, concepts, and ideas. Over the years, the learning program at Shree Bharatalaya has acquired many additional distinctive features. * In addition to compositions of the Tanjavur Quartet and others, which form the core of the Tanjavur tradition of Bharatanatayam, the students learn to sing and perform virtually all the compositions for dance created by Madurai N Krishnan..
* Each student is in a position to substitute for another (at her level) in a dance-drama, if circumstances require it. * All the students learn the meaning of the compositions. * All the students learn to perform special exercises based on the Martha Graham technique. These exercises, taught by Sudharani Raghupathy herself, are aimed at making the dancers' bodies more responsive and flexible, and at creating an understanding of the therapeutic value of dance itself. * All the students are encouraged to learn a variety of crafts, following a suggestion made by Kamaladevi Chattopadhyaya. From the beginning, Shree Bharatalaya has considered itself as one among the many institutions devoted to preservation and propagation of our cultural heritage, especially Bharatanatyam. It has therefore welcomed natyacharyas and dancers and others concerned with this great responsibility, to observe its work and even participate in it as respected guests. So, Shree Bharatalaya has taken the initiative to arrange master classes by outside experts from time to time. Its students benefit from these classes. Typically, the visiting experts share the ideals that guide them, while imparting knowledge and skills. What used to be an occasional event became a regular summer feature in 1992. There were presentations by Tanjavur K P Kittappa Pillai, Kamalambal - an aged dancer belonging to the traditional community, N S Jayalakshmi - a Professor of Dance at Kalakshetra, Bharatanatyam exponent Chitra Visweswaran, V A K Ranga Rao, dance writer and critic and Revathi Sankaran, a Harikatha artiste. 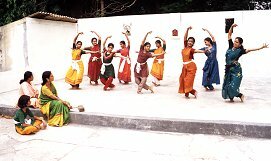 The school has covered sessions in Bharatanatyam, Harikatha, modern dance (They have had regular master classes with Jaan Freeman, a modern dancer based in New York), Vaishnavism, Astrology, Dasar Padas, meditation techniques and compositions of Annamacharya. Students have been given the opportunity to participate in special programs presented for the benefit of visiting dignitaries like US Krishna Rao, Kapila Vatsyayan, Kamaladevi Chattopadhyaya, Girish Karnad and a visiting Chinese delegation to name a few. Considerable research goes on at Shree Bharatalaya, an activity in which the students are also required to participate. The teaching program itself requires research, as a basis for refinement. For example, different lakshana granthas give different numbers of the various hand gestures, and sometimes also describe them differently. Research was needed to sort out and reconcile the different verses and to identify those that are not. The result enabled Shree Bharatalaya students to learn about various acceptable ways of using hand gestures. Each production, whether a dance-drama or a television serial, also requires considerable research concerning history, literature, theme, costume and jewellery, etc., Visits to special libraries, like the Saraswati Mahal Library in Tanjavur, are undertaken if needed. The research is carried out with diligence. For example, just to locate an apt sloka for the dhanur bhanga scene of the Ramayana production, several students searched through Valmiki's Ramayana, Tulsidas' Ramacharitmanas, Kamban's Ramayanam and Arunachala Kavi's Rama Natakam. In addition to specific task oriented research, Shree Bharatalaya's faculty and students keep their eyes open for new manuscripts offering potential for dance, new books on dance and other arts, new visuals and other pertinent materials. Sudharani Raghupathy is the principal instructor in dance. She teaches students of all ages. She also provides instruction on breathing and physical exercises aimed at improving body strength, flexibility and kinetics. Madurai N Krishnan takes group classes in music. He also teaches his new compositions to a select few who then teach others. M S Murali hailing from a parampara of musicians, teaches music and helps in the productions of Shree Bharatalaya. T Krishnaveni, a talented musician, is a post-graduate in music from Sri Sadguru Sangeetha Vidyalaya, Madurai. She teaches vocal music at Shree Bharatalaya. Nandini Anand, a disciple of Padma Vibhushan D K Pattammal, is the prime vocalist for Shree Bharatalaya’s performing artistes. K S R Anirudha, Treasurer-Trustee of Shree Bharatalaya is the prime percussionist, whose jathi compositions are valuable to the dance community. His ability to wield three mridangams at a time is unique. Priya Murle, is a torch bearer of the younger generation in the field of Bharatanatyam. A recipient of the ‘Yuva Kala Bharathi’ award from Bharat Kalachar she also wields the nattuvangam for the dance recitals of Shree Bharatalaya’s students. Padma S Raghavan, a very senior student of Shree Bharatalaya, who, after having run Silambam, (an alliance of Shree Bharatalaya in Indore), is now a senior teaching staff at Shree Bharatalaya. She also conducts recitals. Aruna Subbiah, who has her master’s degree in Mass Communication, is a senior student of Shree Bharatalaya. She received the ‘Yuva Kala Bharathi’ award from Bharat Kalachar last year. N Sasirekha, a keen student of Bharatanatyam, is an assistant teacher at Shree Bharatalaya and also competent in wielding the nattuvangam. In its early years, Shree Bharatalaya had the benefit of the services of three others. Trichur Ramanathan who taught dance, nattuvangam and mridangam; M V Nagarajan who taught dance (adavus); and Srinivasachari who taught Sanskrit. Shree Bharatalaya also had the privilege of having Prof. Thangaswamy Sarma as its Sanskrit Professor. A President’s Award winner for Sanskrit in 1996, he dealt with the theoretical aspects of dance, besides teaching children dhyanaslokas. His passing away recently is a great loss to the students of Sanskrit. Born in Pollachi in 1944, Sudharani grew up in Bangalore. A graduate in Philosophy and Sociology from the University of Mysore, she learned Bharatanatyam from U S Krishna Rao, K P Kittappa Pillai and Mylapore Gowri Amma. She studied Carnatic music under T Chowdiah, K P Kittappa Pillai and Vidwan Madurai N Krishnan. 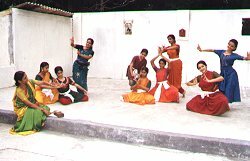 Sudharani underwent advanced training in Modern dance from Eleanor Struppa at Randolph Macon Women's College, (Virginia, U.S.A during 1964-65). She was the first Indian to study in this college and was sponsored as an international student. Sudharani has studied western music from Elaine St. Vincent of the U.S.
Sudharani had the unique honour of performing at the United Nations Headquarters, New York in 1981. She has given solo recitals, choreographed a number of dances and also produced dance-dramas and TV serials. 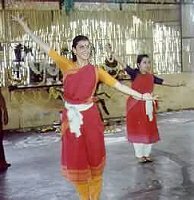 In 1997, Sudharani commemorated 50 years of her dance career. Vidwan Madurai. N. Krishnan a doyen in Carnatic Music and a vaggeyakara (vocalist-lyricist-music composer) with distinction, he is an authentic representative of the Ariyakudi style. Hailing from a musical family, Krishnan had his initial training in Carnatic music from his father and Harikatha vidwan Narayana Iyengar, and from his elder brother and violin vidwan, Srinivasa Iyengar. After his formal training at the Tamil Isai School, Karaikudi, Krishnan received his ‘Sangita Vidwan’ title from the Tamil Nadu Government Music College, Madras. He underwent Gurukula Vasam for 18 years under the Carnatic maestro Ariyakudi Sri Ramanuja Iyengar. An ‘A’ Grade top artiste of AIR, his audio recordings include ‘Thiruppavai’, a double cassette album and ‘Ariyakudi Tradition’, a rendering of songs in the Ariyakudi bani. Krishnan has, furthermore, won acclaim as a composer for dance. As an original composer he has composed several dance numbers of a Bharatanatyam recital like Ranganjalis, Jatiswarams, Shabdams, Kauthuvams, Varnams, Padams and Thillanas fervent with Bhakthi. After the Tanjore Quartet, he is perhaps the only modern composer who has many margams (dance items in the traditional format) to his credit. He has also scored the music for a number of other compositions, including those forming part of dance dramas. Hailing from a family of Swayamacharyas, Krishnan also gives spiritual guidance to his disciples and friends. Shree Bharatalaya institution for fine arts has completed 32 years of service to the cause of Bharatanatyam. Pursuing a holistic and value based approach to human development, graduate students of Shree Bharatalaya stand out, not just for their competence and skills as accomplished dancers, but more important as cultured individuals. · Smitha K Magal who lives and performs in the U.S.A. at Columbus, Ohio, and runs her own Bharatanatyam school named Silambam. · Manjula Lusti Narasimhan who lives and performs in Switzerland and gives recitals in other countries as well. She runs her own Bharatanatyam school named Silambam. · Nalini Prakash who gives performances in different places and conducts her own Bharatnatyam school named Silambam in Wellington. · Shylaja Ramji who has established Silambam in Chennai and performs in different cities. · Priya S Dixit who has established her Silambam in Singapore, and also performs regularly. Shree Bharatalaya has many dance-dramas to its credit. In 1987 it produced a dance-drama based on the Balakandam of the Ramayana, with students of the Colgate University of the U S taking a summer course at Shree Bharatalaya as its dancers. In 1990, it produced a dance-drama on Ramayana based on Kamban's Ramayanam and Arunachala Kavi's Rama Natakam with Bharatalaya students and outside artistes. It was premiered at the Tamil Isai Sangam in Chennai. In 1991 it produced a program called Balakrishna, based on songs on Krishna composed by Ambujam Krishna. It was premiered at Sri Krishna Gana Sabha on Gokulashtami. In the same year it also produced Shakti Prabhavam, which was presented first at Sri Krishna Gana Sabha and later in various other places. 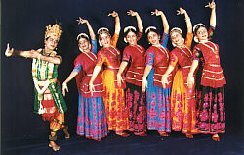 In 1997 it produced a dance drama, Vande Guham Uma Sutham, which was premiered for Karthik Fine Arts at the Bharatiya Vidya Bhavan. Ekameva Na Dvayam and Shankara Loka Shankara are recent productions. In all the productions, the synergistic roles of Sudharani Raghupathy and Madurai N Krishnan constituted one of the most important factors contributing to their success. Some of the achievements based on the accomplishments of Sudharani Raghupathy as a Bharatanatyam exponent and choreographer, have been derivative. 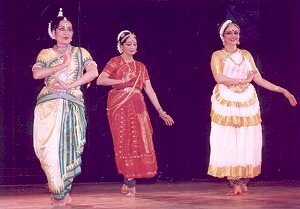 In 1986 Sudharani Raghupathy joined Padma Subrahmanyam and Chitra Visweswaran in choreographing and presenting Viralimalai Kuravanji on Doordarshan - Chennai. This was performed later under the auspices of the chapter of the International Dance Alliance in Chennai. Later, it was a choice program in the Festival of India in the erstwhile U S S R in 1987. In 1989 when the Madras chapter of the International Dance Alliance made a special request for a group item featuring senior students of different schools, Sudharani choreographed and directed the production of Krishnam Vande Jagadgurum with Madurai N. Krishnan scoring the music. Krishnam Vande Jagadgurum had a most successful tour of the U.S.A in 1992. Since 1991, Shree Bharatalaya has been 'home' every summer to different groups of students of the Colgate University (U.S.A), led by Prof. William Skelton, visiting Chennai to study and understand Indian traditions. Several of them learn Bharatanatyam and Carnatic music at Shree Bharatalaya. Achievements of a derivative nature include lecture - demonstrations given by Sudharani Raghupathy, in which she has invariably had Shree Bharatalaya's musicians and students participating. Many of the lecture - demonstrations were given in schools and colleges under an initiative called Education Through Fine Arts, suggested in 1978 by Dr. S Krishnaswamy, Vice-Chancellor of the Madurai Kamaraj University. In recent years lecture - demonstrations are also being given by the senior students of Shree Bharatalaya. They are deputed to various places in India and abroad to conduct workshops and present lec/dems in Bharatanatyam. · The video recording of the Ramayana (a dance-drama for the Centre for Cultural Resources & Training (CCRT) of New Delhi in 1991). Sounds of Bharatanatyam (double cassette) - released by AVM in 1990. Laghu Bharatam - Basic theory of Bharatanatyam - a two-cassette audio album with a recital of the lakshana sloka-s included in the book, along with their meanings given in English. Laghu Bharatam Volume I, II & III - Handbooks on basic theory of Bharatanatyam containing valuable information on the theory and grammar of dance. Volume – I (1995) & Vol. II (1997) taken together, constitute a comprehensive source of information (Aangika, Vaachika, Aaharya and Sathvika Abhinaya) taken from various Sanskrit texts and treatises with English transliteration and translation. Photographs have also been provided for ready reference. ‘Laghu Bharatam – Vol. III’(1999) - an appreciation of Bharatanatyam, is the printed version of the T.V. serial, ‘Bharatanjali’. It provides an overview of the origin & history of dance, the various facets of Bharatanatyam with illustration of adavus through stick figures, ‘Margam’ – the traditional format of a Bharatanatyam recital and the importance of aesthetics in dance. In July 2002, the Tamil Translation of Laghu Bharatam – Vol. III was brought out with the aim of achieving a wider reach. Shree Bharatalaya has painstakingly put together relevant information and selflessly made it available to the world of Indian dance.